Week 3 is in the books and it was a big one in Pennsylvania. The rankings saw plenty of shake-ups in what was the biggest weekend of the season so far! Some very nice weather statewide certainly aided those big performances. Sydney Horn vaulted to the top of the state rankings. The Manheim Township junior cleared 13-00 for the first time in her career to win the pole vault with a PA#1 performance on the young season. 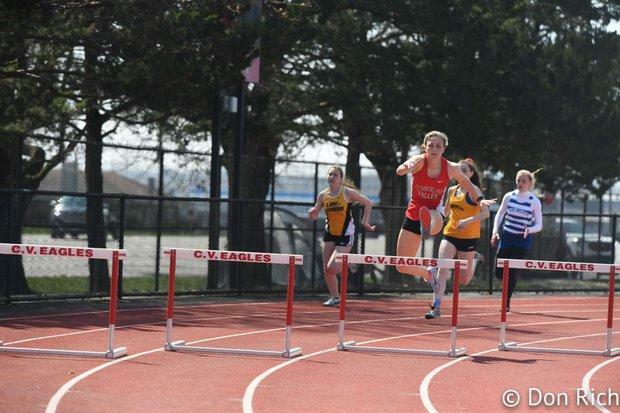 Cumberland Valley's Taylor Jede had a big meet on her home track. She went 45.18, a PA#2, to win the 300 meter hurdles, and then won the 200 meters in 25.68 (PA#6) breaking the CV school record. In the 4x800 meter relay, the Wilson girls out-dueled Northern. Wilson went 9:37.52, a PA#2 for the win. Northern ran a PA#3 time of 9:38.06 for second. Marlee Starliper split about a 2:13 on the third leg for Northern. 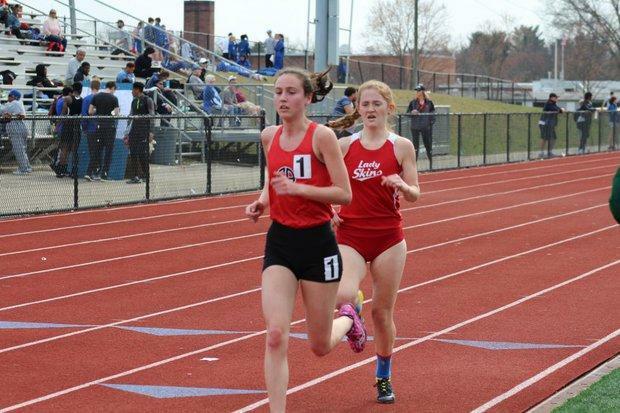 Wilson's Reagan Underwood returned later to take second in the 3200 to Carlisle's Sophia Toti, who ran 10:57 for the win after winning the 1600 earlier in the meet. Wilson's Amanda Tony jumped 37-6.5 for a new PA#2 in the triple jump to earn the win. Her teammate Olivia Moyer threw 126-2 to win the discus (she already sits at PA#4 in the event). Saturday was a big day for State College's limited crew at CV. Luke Knipe won a pair of events, leaping a huge PR of 23-6 in the long jump, a then-PA#1. He came back to win the pole vault, clearing 14-9. Lance Hamilton also had a strong meet. He was second to Knipe in the long jump (22-9), but he had his big moment in the triple jump. Hamilton jumped 49-00, a PA#1 and US#7. He now joins an elite list of just 3 other boys to have jumped 49 or better since 2015. Zachary DeCarmine of SC won the 300-meter hurdles in 39.41, a PA#3 time. The distance races saw some great action. In the 1600 meters, Warwick's Connor Shields went 4:22.09 in the 1600 meters to take the win and a set a new PA#2 on the season. In the 800 meters, Manheim Township's Evan Dorenkamp took home the win (after having already run the 1600) in 1:55.94, a PA#1 time. 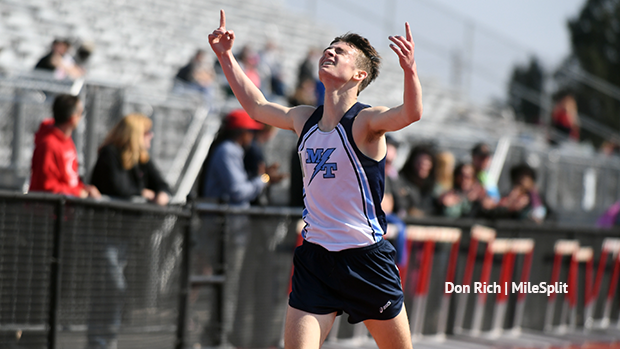 At the end of the meet, Ian Miller of Manheim Township won a good battle with Cumberland Valley's Luke Klingenberg in the 3200 meters. Miller ran 9:25.99 (PA#3) for the win, while Klingenberg was second in 9:35.58. Harrisburg's Kamere Day looked strong in the sprints. He won the 100 meters in 10.80 and then returned to win the 200 meters in 22.38. He also added a leg on Harrisburg's winning 4x100 meter relay. Wilson's Jack Miller won a pair of throws events, tossing 53-6 to win the shot put and then 151-10 to win the discus. There were a number of new PA#1s set at PW on Saturday. In the 300 meter hurdles, Saucon Valley's Talitha Diggs popped a quick 44.61 for the win, shooting her up to the top spot in the state. Earlier in the week, Diggs showed off more of her versatility, jumping a PA#1 of 19-3 at dual meet. Norristown's Teliyah James took the win in a quick 200 meters. James went 24.52, a new PA#1 to edge out Cheltenham's Bria Barnes, who clocked a PA#2 time of 24.54 for second. In the 800 meters, Isabelle Goldstein of Germantown Academy dropped a PA#1 in the 800 meters, winning in 2:16.16, a big PR. GA also had a solid meet in the field. Meaghan Toscano won both the shot put (42-0.25) and the discus (122-8). Liliana Cohen cleared 12-0 to win the pole vault. Cheltenham's Brianna Smith cleared 5-7 in the high jump, a PA#2 in the event. 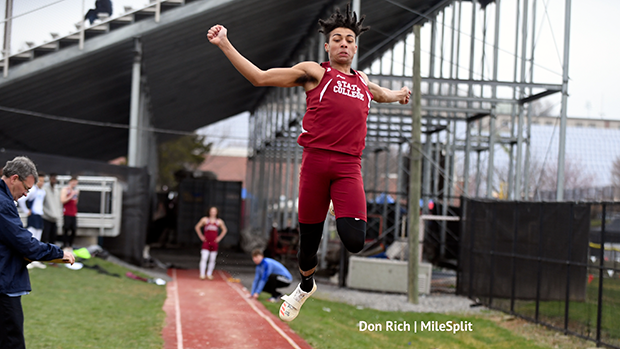 In the jumps, Jaden Price-Whitehead of Upper Dublin won the long jump (PA#5 23-3.25) and then took second in the triple jump. Milton Hershey's Hassan Kamara won that triple jump competition with a leap of 46-5.5 (PA#3), while Price-Whitehead jumped a PA#4 45-10.25. Germantown Academy's Robert DiDonato won the 1600 in a PA#3 4:23.85. In the 200 meters, Tyler Byrd of Bishop McDevitt went 21.87, a PA#3, for the win. It was a big day for the Neumann Goretti girls in Delaware. The Saints put down some impressive performances in the First State. NG went 3:52.34 to win the 4x400 meter relay. That's a major PA#1 for the squad that should continue to drop time in the event this season. The Saints went 1-2 in the 400 meters, also clocking the top two times in the state. 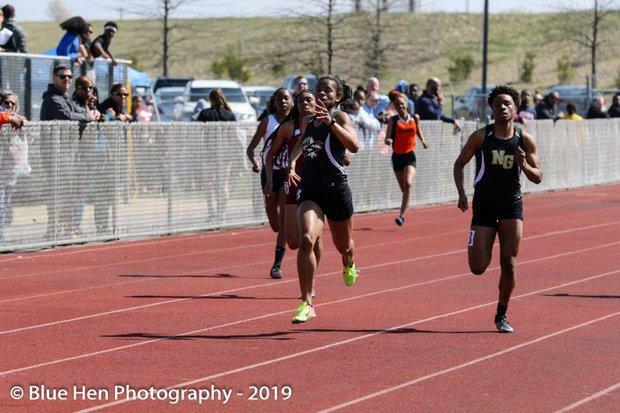 Mykala Perry won in PA#1 56.47 and Dasia Wilson was second in a PA#2 time of 56.66. Penn Wood's Elicia Moore went PA#3 for third in 57.66. Moore won the 300 meter hurdles in 45.50, a PA#3 time, closely followed by Chester's Jiya Clayton (45.71) and Saint Basil's Alina LaForest (PA#6 46.10). Kami Joi Hickson of NG won the 800 meters in 2:18.79, a PA#4 time. Saint Basil Academy's Tia Taylor started her outdoor season off on the right foot, running 14.94 for the 100 meter hurdles, where she placed second. She's the first girl under 15 seconds in the event so far this season. Taylor is the defending AA state champ in the event. The Penn Wood boys won the 4x400 meter relay in 3:21.80, a PA#2 time. A pair of PA stars pulled off double wins at Selinsgrove on Saturday. Greenwood's Mallory Kauffman, already PA#1 in the shot and disc, won those events with tosses of 1457-7 in the discus and 45-7 in the shot put. 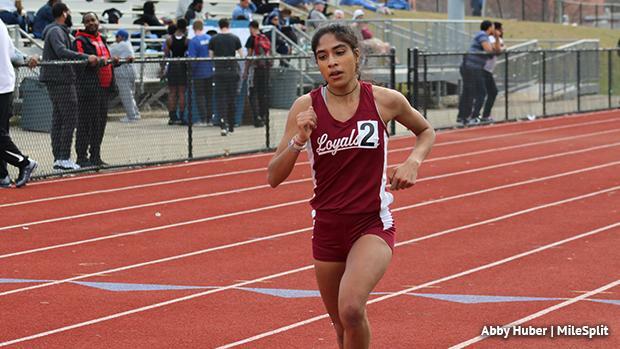 And then Loyalsock's Isabell Sagar continued her torrid start to her senior track season, winning the 1600 in 5:02.81 and then the 3200 in 10:42.27. The 1600 time is a new PA#1, while the 3200 time is just off her own PA#2. Southern Columbia's Julian Fleming is back! The 5-star wide receiver recruit has returned to the runway this spring. He's proving he'll be a major contender. Fleming won the long jump with a leap of 23-3.75, a PA#3 performance. Williamsport's Allen Taylor, who ran a PA#1 in the 110 meter hurdles at Tim Cook last weekend, went 14.56 for the event win at Selinsgrove, keeping up his solid start to 2019. At the West Middlesex Invitational, there were a pair of PA#1s in the throws. In the shot put, Connor Vass-Gal of Wilmington posted a huge PR in the shot put with a toss of 64-4.75, a PA#1. That's the No. 2 performance in the country by a sophomore. In the discus, Hickory's Brock Grundy threw 174-6, a PA#1, which is over a 10 foot PR by the reigning AA state champ. At the Knights Invitational at North Penn, Timmy Odunjo of Penn Wood improved on his own PA#1 time in the 300-meter hurdles, clocking a 38.24 for the win. LaSalle's Paul Ghantous led 1:57.79 six boys under 2 minutes in a very fast 800 meters. Central Bucks West's Luke Benson won the 100 meters in 10.87. At the West Chester University Golden Ram Invitational, Jessica Schneider of the Academy of Notre Dame ran a PA#5 of 2:18.90 for the win (WATCH RACE VIDEOS!). At the Bedford Giant Eagle Invitational, the throws took centerstage, though Chestnut Ridge's Logan Pfister went to PA#1 in the high jump, clearing 6-6 for the win. Chestnut Ridge's Duane Knisley won the discus with a toss of 170-7, a PA#2 performance. Somerset Area's Nick Hyde threw a season best and PA#2 of 60-10 in the shot put for the victory. At the Council Rock Kiwanis Invitational at CR North, Savion Hebron of Neshaminy won the rare 110 meter dash and then returned to run 21.80, a PA#2, to win the 200 meters. Pennridge was impressive, winning the boys 4x400 in a PA#1 time of 3:17.90. The Rams were second to Twin Valley in the 4x800 meter relay, which ran well with a PA#2 time of 8:01.01. At the Knoch Relays, Butler's Jack Codispot vaulted to the state lead. The senior jumped 15-2, a new PA#1, to win the pole vault. Moniteau's James Parenti won the discus with a PA#5 toss of 157-3. In the high jump, Taylor Newton of Elk County Catholic cleared a T-PA#5 of 5-4. At the Whippet Invitational at Downingtown West, Souderton's Maria Deaviz tossed a huge PR in the shot put, launching a throw of 46-1, a PA#2 for the win. Garnet Valley's Larry Coaxum took home a pair of wins in the jumps, taking the long jump and triple jump (45-10).